Guest Post: Rebecca Arno, vice president communications, Denver Foundation, and vice chair, Communications Network. This post is reprinted with permission from CausePlanet.org. I’ve killed a lot of trees in my two decades in the nonprofit sector, even though I switched to using recycled paper in the early ‘90s. Direct mail, annual reports, newsletters, issue briefs…you name it, I’ve produced it! All in service to the mission, of course. Not too surprising, you say. Such is the stock-in-trade of the communications professional. But today’s virtually driven world calls for a whole new way of looking at publications. What do we choose to print? What goes virtual? How do you decide, and once you’ve made the choice…how do you know you made the right one? Some organizations have chosen an entirely virtual route. This is certainly cost-effective–online tools are generally pennies on the dollar compared to the old-fashioned communications mechanisms. But the real measure of whether such a switch is in the right direction isn’t simply cost savings…it’s the cost/benefit analysis. You need to understand whether your new, virtual communications are getting you the same results with your audiences….or, hopefully, better results. 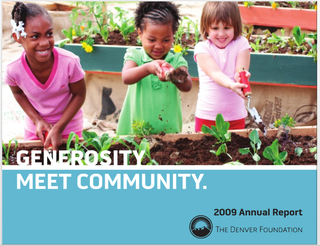 In a meeting of The Denver Foundation’s volunteer Communications Committee several ago, we proposed taking our annual report online. One committee member said, “Watch out. When you put everything online, the organization starts to feel less real to people. You don’t want to become just another virtual organization.” He certainly gave us something to think about. The Denver Foundation has been around for 85 years. We help philanthropists make major, long-term investments to meet local needs and accomplish their charitable goals. Our donors are often over 55 and they want to know we’re substantial and we’re here to stay. At the same time, it was hard to justify those 72-page, printed annual reports, listing every grant and every contribution. So, we did a focus group with our donors, certain we would hear that they simply recycled the publication or tossed it out. To our surprise and delight, we learned that they deeply valued the annual report. They put it on the coffee tables in their living rooms, on the bedside tables in their guest rooms. They kept it for reference. Don’t change it! they said. We love it! Another year went by and another. We started getting requests for searchable versions of our annual report lists. Research showed that more high-net-worth and older donors were online. And the dollars available for publications increasingly tightened. But we still hadn’t forgotten our committee member’s warning and our donors’ words. So, we decided to create a hybrid annual report. The lists would go online, but we’d still print a report that could be handed to prospective donors or kept on a coffee table. The printed length of our new report is now sixteen pages. We print financial information, the letter from the CEO and Board chair and a few key and exciting stories. We also include photos and lists of our board members and volunteers, as well as our staff. A donor who holds the report in his or her hands and thumbs through it will see dozens of faces of The Denver Foundation…a real, living and breathing, substantial place that can help their charitable dreams come true. Printing and design costs have dropped precipitously, even though we are able to print the whole publication in four-color now. We did have to pay a web company to develop an online version of the report for us, with searchable grants and contributor lists, but the combined costs are still dramatically lower than the 72-page dinosaur. I can visualize the forests of trees and gallons of ink we’re saving. The cost/benefit? Fundraising remains strong. Donors still ask for, read and respond to the slimmer version, and hundreds of people have visited the online report and searched the lists. Because it is shorter, the new annual report gives us a chance to think about the purpose of the publication more effectively. The old, kitchen-sink version that contained a list for everyone and page for every program didn’t allow us to target messages to donors and prospective donors, the key audiences for the publication. This year, with our audiences firmly in mind, we’re adding another four pages to include two lists: one of donors who give to our Community Endowment (the cornerstone of our grantmaking) and one of our Community Legacy Society members. These donors are the foundation of our work. Not only do they deserve recognition, we want to encourage others to follow in their footsteps. Of course, the annual report is only one way we communicate with our key audiences at The Denver Foundation. But we have taken each one of our print pieces through the same process: we’ve assessed the needs and interests of our audiences, analyzed their information-gathering habits and reviewed the available tools. Then we’ve decided how to create the best suite of materials to reach our audiences. Overall, this means the annual report is joined by a virtual newsletter called “Catalyst” for the broadest swath of our audiences. It is a quarterly print newsletter just for donors who have created charitable funds with us, a “Good News” periodic e-mail for our donors and a technical assistance blog for our grantees. We also have two other annual print reports and three other virtual newsletters for various programs of the Foundation. Because we listen carefully to our target audiences, this mix is always changing. We began to hear feedback that our closest friends and donors weren’t seeing our Catalyst newsletter, so we decided to print one issue each fall in a broadside format. We received a number of thank-you notes for this version and several folks mentioned they’d wondered where our newsletter had gone. So, a few more (recycled) trees and gallons of (soy-based) ink are pressed into service for The Denver Foundation. The virtual world offers nonprofit communicators an incredible array of cool tools and low-cost options, but publications are still what they always were: a way for us to carry our stories, our messages and our calls to action to our key audiences, and to encourage them to support us in our missions. As long as we remember to check with those audiences before and after we take any action to move to online publications, we’ll still be accomplishing those goals.